In previous posts, I have written about the historical omnipresence of mercury in medicine. For my new research project, I am trying to figure out how the first academic chemists looked at mercury, and whether the experiments they did with it changed the way mercury was used in drugs. In the early eighteenth century, the chemical laboratory was slowly but steadily integrated in university research and teaching. Taking its materials and procedures mostly from traditional alchemy, the early academic chemists tried to distance themselves and their new practice from the negative associations alchemy also included, like quackery and gold making. The academic chemists wanted to combine laboratory practice and philosophy to gain an better understanding of the composition and characteristics of all kinds of materials, and hoped this would also enable them to improve the effectiveness of medical remedies. 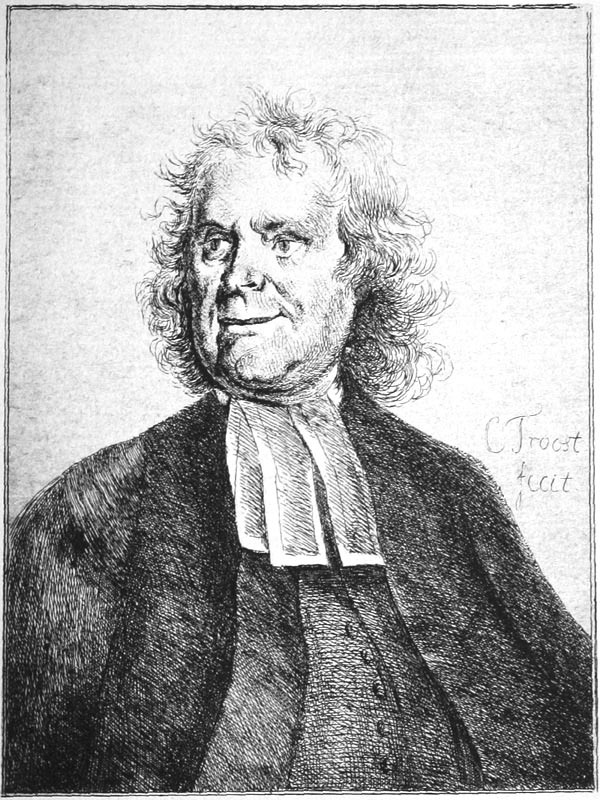 For example, the famous Leiden professor of botany, medicine and chemistry Herman Boerhaave (1668-1738) spend a substantial part of the last decade of his live experimenting with mercury. He wondered whether purified mercury was the primal matter that could serve as a universal remedy. Not very surprising, because the actual substance of mercury was thought to have the same qualities as the god Mercury and philosophical mercury, an alchemical concept which was not necessarily the same as the actual material. I know, this sounds vague, and it is – part of my research project is trying to find out whether the early academic chemists actually distinguished between philosophical and material mercury, or that they saw them as interchangeable entities with the same qualities. This multiplicity of mercury is nicely demonstrated in John Woodall’s 1617 The Ships’ Surgeons’ Mate, a handbook for young ships’ surgeons’ with little training on how to dress wounds, use chirurgical instruments and prepare medication. ‘Mercury,’ from John Woodall, The Ships’ Surgeons’ Mate, 1617.
with Sol in circuit once a day. hence winged, I fly in haste. In this text, we see that a number of characteristics of the substance / planet / god are effortlessly combined: the strange shape and habits of the metal that can change from a substance to a vapour, a ‘blast;’ the planet that orbits the sun and is thus circled by earth once a day, and the winged, hastily flying messenger god. 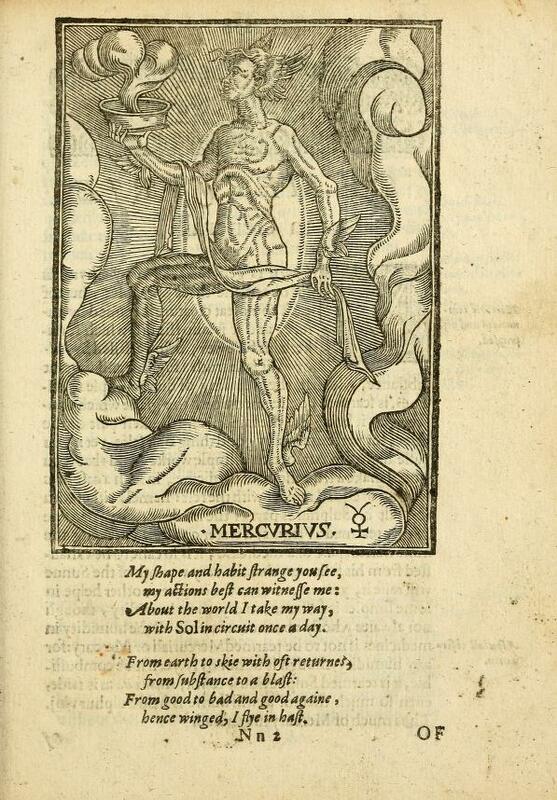 Also, it mentions that mercury has a good and a bad side, something that is also stressed in the last verse of the poem on sulfur: “Though Sulphur, Sal and Mercurie, have healing medicines store, yet know the’ have poison and can kill, prepare them well therefore.” To be continued! In our culture, we have a deeply ingrained aversion against ingesting other people’s bodies and bodily substances. Or don’t we? It seems a bit random, as exchanges of certain bodily fluids between partners are generally accepted as long as it happens in private, as are blood and organ donations. Yet the idea of ingesting (preparations of) human flesh, bones, blood, hair, nails, urine, and other excrements evokes associations with cannibalism, which is a big taboo. However, historically speaking, this aversion is fairly recent and the practical uses of death human bodies were quite varied. For example, as my colleague Lindsey Fitzharris pointed out on her brilliant blog The Chirurgeon’s Apprentice earlier this year, anthropodermic bibliopegy, or book covers made of human skin were quite mainstream items once, particularly around the French revolution. And it didn’t stop at book covers: up until the eighteenth century, human remains were regularly used in drugs. 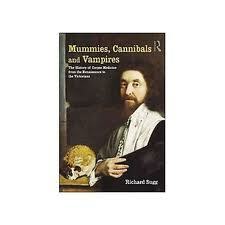 Richard Sugg wrote a fascinating book about this, Mummies, Cannibals and Vampires. The History of Corpse Medicine from the Renaissance to the Victorians (Routledge, London 2011). Sugg’s work is based mainly on English-language sources, but ‘corpse medicine’ was a phenomenon through all of Europe, and the Low Countries were no exception. human flesh was thought to have great healing qualities – even better than human flesh from Tenerife, Napels or the African desert. According to Heurnius, this was due to the specific mix of spices used in the embalming process. So I was not entirely surprised this week when I found various recipes listing human bodily tissue in the Collectanea chymica Leidensia (1684, various reprints), a book consisting of drug recipes by Leiden University chemistry professors compiled by an English student. Cadavers, mummie, embryos and human blood are all listed as simplica (base ingredients), apparently without causing any controversy. The recipe for preparing ‘mummie’ on page 317 in the 1693 edition calls for the flesh of a human who died a violent death (“Carnis hominis, violenta morte perempti”) and the resulting preparation was apparently very helpful in internal lesions, hemorrhaged lungs and ‘marasmo’ or loss of strength, to name a few ailments. Strange as it may sound to us now, the idea was probably that a person who died a violent dead was most likely not very calm at the time of his death, and that this excitement could be preserved in his flesh and subsequently transferred successfully to the body of the patient, where it would have a healing and invigorating effect. After focusing on objects and materiality for a bit, this week I returned to the library to read texts. It struck me once again how dense very small pieces of text can be. 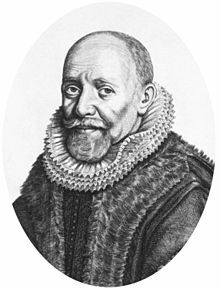 Part of my new project on metals in Boerhaavian chemistry is getting an idea of how popular and academic medicine worked in practice before Boerhaave. To this end, I am reading late seventeenth-century chemical and pharmaceutical handbooks. From just the two-page foreword of a Dutch 1667 ‘Galenic and Chymical’ pharmaceutical handbook, I could derive the so much about how a seventeenth-century pharmacy functioned, that I want to share it with you. This handbook is a bit of an exception as it is Dutch, while most chemical and pharmaceutical handbooks of the time were in Latin. But although apothecaries were generally expected to understand Latin, in practice this was not always the case. Unlike today, an apothecary did not need a university degree to practice, and most learned their trade as an apprentice after a couple of years at school. This education system made perfect sense to the author of the handbook, as many of the common ‘compositions’ made by the apothecary were not described in any book: making them was tacit knowledge, not even transferred from master to apprentice orally, but through demonstration and doing. As a sort of supplement to this very practical training, this particular handbook was aimed at young student-apothecaries, and advised them to make sure they learned the Latin names of all the Simplica and herbs (base ingredients) by heart. The author – a Jesuit apothecary – suggests several ways in which this could be achieved: by keeping a list of all the simplica supplied by the druggist and frequently pouring over this, by studying herbaria and other books, by regularly checking the written signs in the apothecary garden, and by looking up the herbs brought in by the ‘herb-fetchers’ (Kruydt-haelders) in books and marking them appropriately after drying. From this advice, we can deduct a number of other things, like that the apothecary and his apprentice were part of a professional network consisting of at least a druggist and a herb-fetcher. The herb-fetcher is described as getting all the herbs growing in the wild for the apothecary in the cities, and the druggist functioned as a sort of whole-seller of base ingredients for the apothecary. The text also indicates that an apothecary generally had his own herb garden and books, and combined with the fact that he needed to understand at least some Latin, this made the profession a quite respectable one. We still tend to think of apothecary as a quite respectable profession, but by no means do we think of the apothecary and the alchemist as closely related professions. Yet in the seventeenth century they were: the title page of this handbook reads ‘Galenic & Chymical Pharmacy, That is: Apothecary and Alchymist’ (Pharmacia Galenica & Chymica, Dat is: Apotheker en Alchymiste). Source: Bisschop, Jan. Pharmacia Galenica & Chymica, Dat Is Apotheker Ende Alchymiste Ofte Distilleer-konste : Begrĳpende De Beginselen Ende Fondamenten Der Selver. Verdeylt in Acht Boecken, Tot Onderwĳsinge Der Apothekers / Door Een Liefhebber Derselver Konste Nieu Licht Der Apotekers En Distilleerkonst. Antwerpen: Reynier Sleghers, 1667.